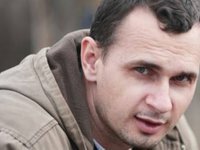 Ukrainian filmmaker Oleh Sentsov, who is serving 20 years in prison in Russia on terrorism charges, has been included in the preliminary list of candidates for the European Parliament's 2018 Sakharov Prize for Freedom of Thought. The presentation of the nominees for the award was held at a joint meeting of the European Parliament Committee on Foreign Affairs and Development and the Subcommittee on Human Rights in Brussels on Thursday. Sentsov was nominated by the European Parliament's largest political faction, the European People's Party (EPP). Factions and groups of deputies in the European Union have put forward eight people and non-governmental organizations as candidates for this year's prize, which is intended to honor those who defend democracy and basic rights around the world. Following debate, all eight were included in the initial list. It was announced that a shortlist of three candidates will be determined through a vote at a similar joint meeting on October 9.